An early works letter is a practical way to get started on a project before the formal contract is finalised. Properly prepared, an early works letter will give both parties protection before the final contract is put in place. 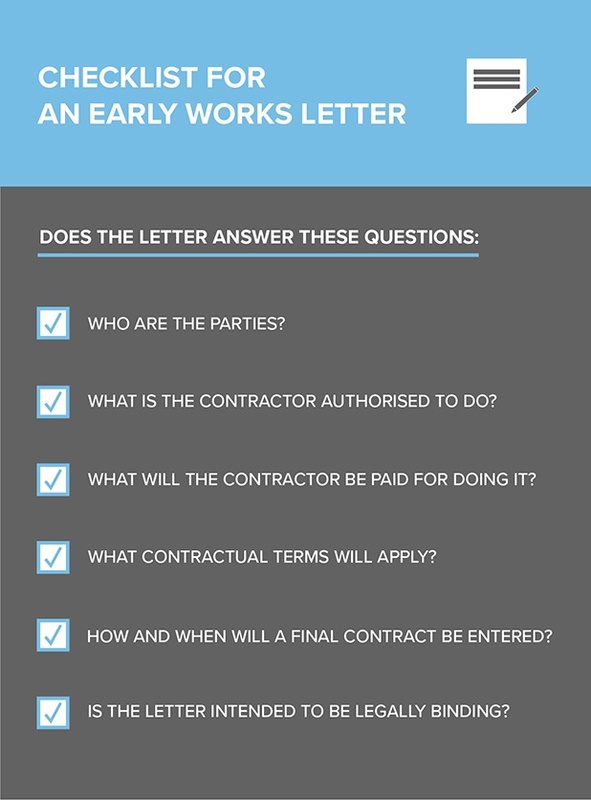 At a minimum, an effective early works letter should answer each of the questions below. 1. Who are the parties? from the principal’s perspective, it will be important to ensure the correct contractor entity is identified (eg not a trust, not a subsidiary – but the actual entity that will be responsible for the work). 2. What is the contractor authorised to do? specific activities identified in the letter (for example identified pre-construction activities and site establishment). So that there is no potential for confusion about the agreed scope, the principal’s project requirements or design documents are usually referenced. This can be done by attaching a document register, or at least referring to the relevant version (eg ‘Document Register Revision 2 issued by the principal by email dated 3 March 2018’). 3. What will the contractor be paid? If the intention is for the contractor to be paid for works or services performed under the early works letter, this should be stated. Further, the letter should explain how the contractor’s compensation will be calculated. For example, the contractor might be paid a fee plus the actual direct costs incurred. Alternatively, it might be calculated as a percentage of work completed, by reference to the contractor’s tender. Or it may be that a schedule of agreed rates will apply. Similarly, the letter may cap the value of the amount the principal might be required to pay under the letter, or it may be left uncapped. Whatever the arrangement is, it should be described in the letter. This will minimise the potential for disputes later, regardless of whether the project proceeds or the formal contract is finalised. 4. What contractual terms will apply? Typically, an early works letter is intended to create legally binding obligations between the parties. Legal terms, being all of the detailed terms and conditions that, once finalised, will be contained in the formal contract. If almost all of the terms in the final contract have been agreed (with limited exceptions), the document should state this, and identify the exceptions. Ideally, the draft contract should be attached or referenced in the body of the letter, and identify which parts have or have not been agreed. The letter should also refer to the fact that it is intended to be an interim arrangement, and that it is intended to be superseded by the final contract (once signed). 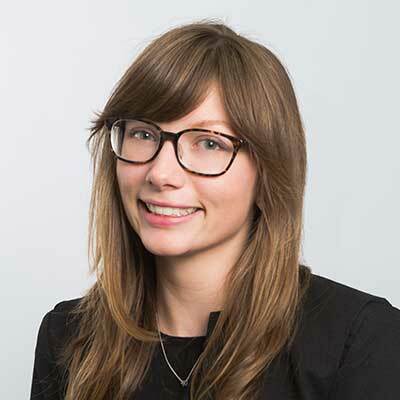 If specific arrangements are intended to apply if a final contract is not entered – for example, in relation to the provision of documents, warranties or materials, or regarding site demobilisation – these should also be set out. 5. How and when will a final contract be entered? As mentioned earlier, the purpose of an early works letter is to create a legal platform to enable the project to start while the parties are finalising the contract. The letter should contain a mutual commitment to negotiate and finalise the formal contract in good faith and as quickly as possible. Where the principal is concerned about the risk of losing the contractor to another project, and where the parties are not yet in a position to commence work, it may be worth including a clause to the effect that the parties will be negotiating with each other on an exclusive basis, at least for a period of time. This is intended to give both parties comfort that they are genuine about their intentions to proceed with the engagement. Ideally, a realistic target date for finalising the contract should be mentioned. Having a specific date mentioned will help the parties to focus their attention, and increase the chances of the contract actually being finalised within a reasonable period. Often, an early works letter will expire within a stated period. Again, this is to encourage the parties to finalise the formal contract as quickly as possible. Where there is an expiry clause, there will often be a provision that allows extensions, with the intention that the letter will continue to apply until the final contract has been signed. It is important to ensure that the terms of the letter continue to apply up until the contract is signed. If the letter needs to be extended or renewed to achieve this, that should be done. This is to give both parties certainty around the terms of the engagement if the finalisation of the contract is delayed or never happens for some reason. 6. Is the letter intended to be binding? The purpose of most early works letters is to enable the contractor to start doing something, with the expectation that they will be paid for doing it. Where that is the case, the letter should state that it is intended to be binding (or at least not contain anything to suggest that it is non-binding). Letters of intent, which merely refer to a party’s intention to do something in the future, can be problematic. This is because an intention to do something in the future can be interpreted and applied quite differently to an immediately binding legal commitment. Letters which express themselves as being ‘subject to contract’ are equally problematic. If the parties’ intention is to create immediately binding obligations, even if they are limited to the early works period, the letter should reflect this unambiguously. The letter should be signed by both parties to evidence their mutual commitment to its terms. A recent case in the UK demonstrates the risks of not understanding the impact of an early works letter. In this case, Arcadis (formerly Hyder Consulting) was engaged to design a carpark. The parties never entered into a formal contract, despite that being their original intention. Instead, the parties proceeded with the works based on correspondence. Many years later, the carpark was found to be defective. The contractor responsible for the work brought a large claim against Hyder, alleging that its design was defective and that the carpark potentially had to be demolished and rebuilt. One of Hyder’s defences was that its liability was limited. This was because, on Hyder’s case, it had performed the works based on a contract that arose out of correspondence that expressly referred to Hyder’s liability being limited. The problem for Hyder was that the contractor denied having reached an agreement on Hyder’s terms. … there is no limitation of Hyder's liability, despite the fact that every set of proposed terms and conditions included some sort of provision to that effect (albeit in radically different terms). Superficially, therefore, this might be regarded as a harsh result for Hyder. But on a proper analysis, I am bound to conclude that this was the inevitable consequence of Hyder's dilatory and often unco-operative approach to the proposed Protocol agreement and the negotiation of the terms and conditions. This case starkly demonstrates the commercial truism that it is usually better for a party to reach a full agreement (which in this case would almost certainly have included some sort of cap on their liability) through a process of negotiation and give-and-take, rather than to delay and then fail to reach any detailed agreement at all. A good early works letter will always be project specific, even if it is based on a template. The key is to ensure the document accurately captures the parties’ intentions, noting that these will vary from project to project. Finally, it is important to appreciate that the terms of your early works letter will continue to apply until the parties enter into a formal contract. If for any reason the parties never enter into a formal contract, your early works letter is likely to be the key source of your rights and obligations. Consequently, it’s critical to get it right.